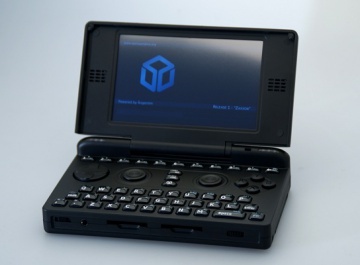 The OpenPandora is a pocket sized computer which is a combination of a PC and a Gaming Console. OpenPandora has a D-Pad, Two analogue nubs, ABXY + Shoulder Buttons and a 43-button QWERTY keyboard. The OpenPandora is fast enough to run a full ARM based Operating System, access the internet, play games and do stuff productively if desired. A/B/X/Y and shoulder buttons for gaming. Can be clocked higher or lower by software designed for the device. Unbrickable design with integrated boot loader for safe code experimentation. Power and hold switch useful for "instant on" and key lockout to aid in media player applications on the go. The OpenPandora should not be used by Children under the age of 3 due to potential choking hazards. The OpenPandora's Battery should only be charged with supplied charger / Via USB or a suitable third party charger. The OpenPandora should only be used in temperatures above -10°C (14°F) and below 40°C (104°F). Standard one year warranty applies to the OpenPandora. User Neglect / Modifications are generally not covered by warranty. Place the battery inside the battery compartment underneath the OpenPandora taking care to ensure the battery contacts and battery touch. Replace the battery cover and your OpenPandora will power up. As this is your first time using the Battery it is recommended you fully charge your OpenPandora to 100% using the AC Adapter as this will calibrate and improve the lifetime of your battery. This process may take up to 4 hours. If you're not planning on using the OpenPandora whilst it is charging you should flip the power switch to the left (Low Power Mode) as it should decrease the charging time dramatically. Once the OpenPandora has completed charging it will stop charging and begin discharging to protect the battery from damage. You can find more useful information about charging on the Power Modes page. While you are charging your OpenPandora completing the first boot wizard is essential. Calibrate Touchscreen - This will ensure that the TouchScreen works perfectly. Choose a name for your OpenPandora - Give it a fancy name as this will be the network visible name. TimeZone / Date and Time - Recommended you do set this correctly as it may cause problems down the track with certain applications. CPU Clock Speed - Recommended that you set to Default unless a game / application is running slowly. Advanced settings - Do not change until you are comfortable with the device. The OpenPandora nubs are designed to automatically calibrate when you turn your Pandora & Calibration is lost once the OpenPandora is switched off. See the GUI page for more details on the user interfaces which can be used with the Pandora. Mini Menu is a quick and easy to use launcher created by OpenPandora's great friend Skeezix. Mini Menu is designed to be fully reskinnable. The main grid of Mini Menu displays the available applications, category tabs, Date / Time, Battery life and a detail pane on the right. When you copy a PND to SDCARDNAME/pandora/apps it will appear in its preset category. Launch a PND by pressing 'Start', 'B' or touching the icon with the stylus or finger. Press 'Y' for documentation if there is any available. The desktop contains icons which have been found on SD Cards / in Firmware. On the bottom left the Pandora menu contains all your applications sorted into the appropriate categories. The task bar by default contains settings for Brightness and Sound, various enablers such as Wifi, Bluetooth and USB host, Network Connectivity, Battery life, Date / Time and various workspaces you can select. If a window for an application is too big for the screen you can drag the window around by holding the left trigger and dragging with the stylus. Pushing the power button to the left will turn the OpenPandora to low power mode for conserving battery which is similar to sleep mode on a computer but the Pandora can still run. The Power modes page provides more information. Occasionally something will happen causing your Pandora to become unresponsive (to the point that even killing a program isn't possible). When this happens it is necessary to force your Pandora to restart. The easiest way to do this is by holding the Pandora button and moving the power switch to the right. Updating the OS can be done via either full Reflash or the Upgrade Pandora OS Application which is found in the System Menu. OpenPandora Repo - Has over 1000 applications which are either free or at a very low cost. Applications do not contain DRM. Open HandHelds - An older site which may not have the latest applications but you'll find a heap of applications that are archive worthy. Angstrom Repository - Contains several applications for your Pandora. It is not really recommended that you use this unless you are an advanced user. You can use PNDManager or PNDStore to download software from the repo and save it in the appropriate directory in one operation. PNDManager is recommended as the most user-friendly way of doing this. The application should generate the required appdata folder when launched. Codecs are not bundled with the Pandora because there are different licensing laws in different countries. Note: You must perform the previous step in order to do this one! If you are not connected to WiFi, do this on another computer. Scroll the left hand list down, select the name of your SD card or mmcblkxxx if your card is not labeled. Basic Linux Guide - For those who don't know very much about Linux and want to learn more. Minimenu Configuration Documentation - If you want to customize or configure Minimenu. Games - Take a look at the games that are available. Software projects - A list of all non-emulator, non-game software for Pandora. This page was last edited on 8 October 2013, at 02:38.